Enter the end of the awkward daily deal printout. Have you ever had the experience of buying a deal from Groupon or LivingSocial, getting to the merchant (a restaurant, let’s say), and awkwardly giving the server a crumpled piece of paper to prove that you deserve $20 worth of food for just $10? LevelUp, a recently released app from Google Ventures-backed game platform SCVNGR, wants to lower the daily deal embarrassment factor, courtesy of a partnership with American Express that allows users to redeem deals without having to show a printed-out piece of paper or hold up their cell phone to merchants. LevelUp is similar to other daily deal sites, but with one big difference: Instead of providing one-off deals, the six-week-old service provides three levels of deals (good, better, and best). So a user might unlock the first deal at a rock-climbing gym, for example, by purchasing a discounted introduction to rock-climbing class. Once that deal has been unlocked, the user would gain access to a second deal (an intermediate class and gear rental), and once that is purchased, the user gets the level three deal of a discounted membership to the gym. Whereas sites like Groupon and LivingSocial get a 50% commission when a user cashes in a deal, SCVNGR gets no commission from users who unlock a level one deal–instead, the company gets a 25% commission from both the level two and level three deals. ” If we can’t get customers back on time two and three, we haven’t done our job,” Seth Priebatsch, SCVNGR‘s founder and “chief ninja,” tells Fast Company. Enter LevelUp’s partnership with American Express. In addition to the promise of getting ever more enticing deals from merchants, LevelUp users can now paperlessly redeem their deals. In practical terms, this means that users can send purchased deals directly to their American Express cards through a one-time linking process, give the card to a participating merchant, and get an instant digital receipt via email and a cell phone push notification. “For a card member, this means no more coupons, no more printing anything out, no more showing your phone at the point of sale,” explained David Wolf, Vice President of Global Marketing Capabilities at American Express, at a press conference. It is, in other words, the end of the awkward printout. And for merchants, it means no more dealing with the hassle of daily deal coupons at the point of sale–AmEx does all the dirty work behind the scenes. 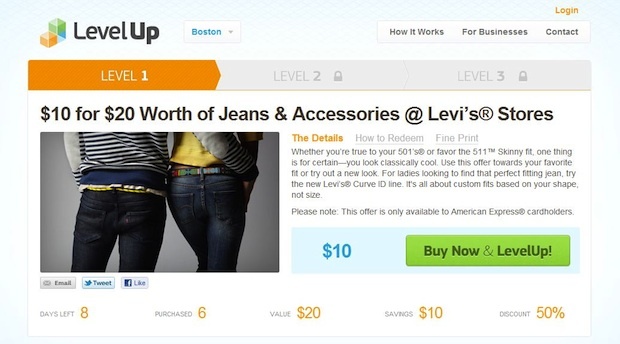 The AmEx partnership is only available at the moment for a LevelUp deal at select Levi’s stores in San Francisco, Philadelphia, and Boston (one store in each city)–and the LevelUp app itself is only active in Boston and Philadelphia, with the exception of the San Francisco Levi’s deal. But LevelUp is expanding to new cities this summer, and if all goes as planned, the American Express partnership will also expand in the near future.